The information reaching this medium have it that most of the billboards in major areas of ilorin metropolis will soon be removed. It would be recalled the Commissioner of Environment, Hon. Justus Sayo Amos through one Bilewn Babatunde. 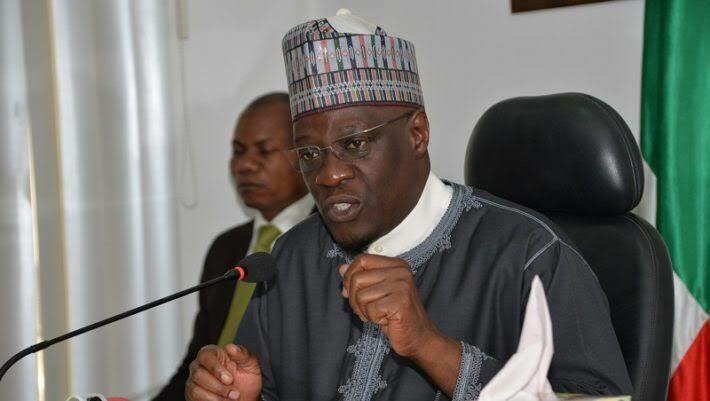 A, had recently written to the Kwara State Signage and Advertisement Agency (KWASAA) demanding the removal billboards. 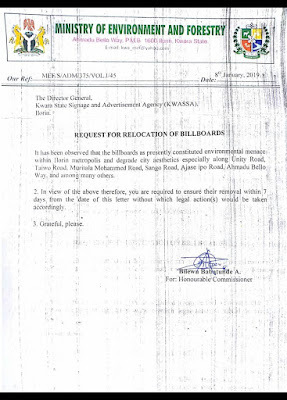 According to Fresh Insight a letter dated on the 8th January, 2019 reads "It has been observed that the billboards presently constitute Environmental menace within ilorin and degrade the city's aesthetics, especially along Unity road, Taiwo road, Murtala Muhammed way, Sango road, Ajase-Ipo road, Ahmadu Bello way among others. "In view of the above therefore, you're required to ensure their removal within the next 7 days from the day of this letter, without which legal actions would be taken accordingly" it stressed. However, while the letter failed to state the exact reasons behind planned removal, according to an impeccable source who was privy to the behind the scene happenings, he described the directive as a "fallout of the complaint against the proliferation the Ó TÓ GÉ signage, which is giving the ruling party sleepless nights. "The removal order is targeted at the APC, they're the most active party in terms of outdoor advertisement and the signage exposure is giving the opposition an undue edge over the ruling party, with the billboard winning sympathy for the opposition" he stressed. 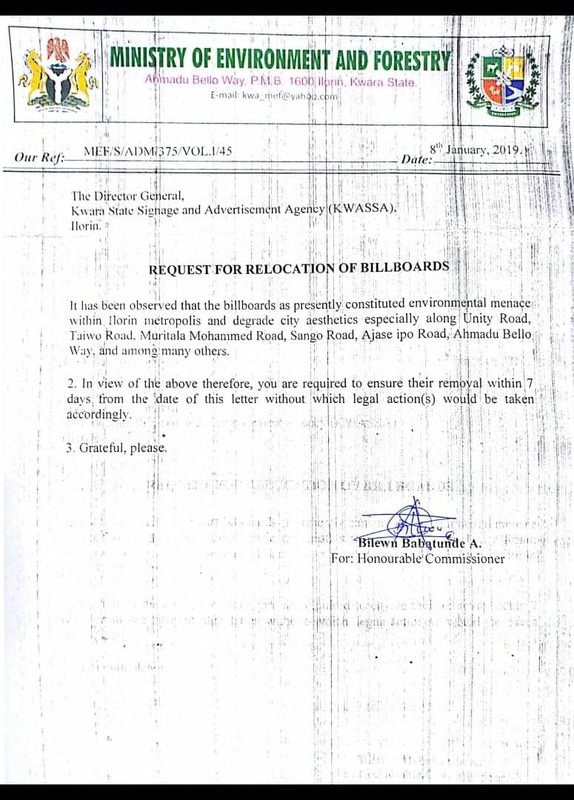 Meanwhile the outdoor advertising practitioners, are making frantic efforts towards arresting the impending mass removal, according to an information gotten from top echelon of the association, the source said "KWASAA and Commissioner for Environment and his Management team met severally on the letter written to the Agency on the removal of billboards and other structures on major streets in Ilorin. "The Agency agreed with the Ministry that some billboards are too close to each other breaching our professional and regulatory ethics. We were informed that the directive for the removal and clean up is a decision taken by the SEC with the Governor in attendance. "The Agency put a spirited defense on why the clean up should be delayed for some time to give the Agency time to contact all Stakeholders. The Agency was advised to take such permission from the Governor as he has the final say on all such matters" it stressed. thanks alot...we will surely do that.